Unprecedented flooding in the Corpus Christi and Houston/Galveston Bay areas caused by Hurricane Harvey has left businesses, residents and first responders in one of the nation’s largest petroleum and chemical processing regions with more to worry about than rising waters. Secondary effects of the flooding have created high risk of exposure to hazardous chemicals in the affected areas, endangering the health and safety of area residents and putting first responders in harm’s way. Several major incidents have already been reported throughout the region, including a high-profile accident which occurred at the Arkema Inc. plant in Crosby, Texas 25 miles northeast of Houston. The facility manufactures organic peroxides, a class of widely used chemicals which, if not stored at sufficiently low temperature, can ignite and explode. In addition, several types of organic peroxides are both toxic and corrosive, and may be present in both the liquid and gaseous state, creating the risk of exposure through inhalation, eye or skin contact, or swallowing. The incident began Sunday, August 27 when flood waters caused a loss of power to the facility and rendered backup generators inoperative. Without the ability to keep the chemicals cooled to the appropriate temperature, they began to decompose at an accelerating rate, resulting in multiple storage vessels exploding early in the morning of August 31. More than a dozen law enforcement officers from the Harris County Sheriff Department who responded to the scene were exposed to smoke and fumes from the explosion, with some requiring medical attention. The amount of hazardous chemicals released as a result of unplanned emissions in just the first week following Harvey’s landfall was equal to the average amount released over a three-month period last year, according to Texas Commission on Environmental Quality (TCEQ) data. As a result, first responders working on-site or in the vicinity of these facilities are at substantially increased risk for exposure, given the nature of their responsibilities. 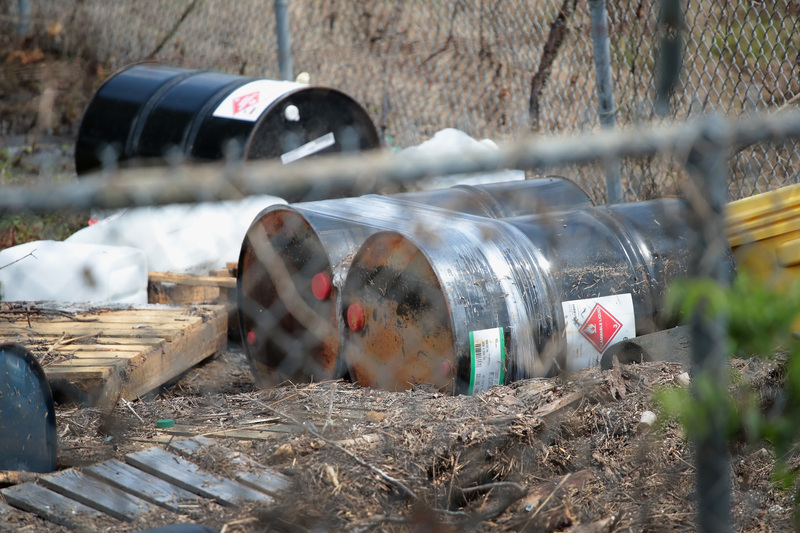 Numerous petroleum processing and chemical manufacturing facilities in the area have reported both intentional and accidental releases of hazardous chemicals from their facilities as a direct result of the heavy rains and flooding. Several area facilities purposefully flared hundreds of thousands of pounds of hazardous chemicals prior to Harvey’s landfall as a precaution to avoid accidental release, while many of the accidental releases that were reported occurred as the result of extreme levels of water accumulating on top of floating roof chemical storage tanks, compromising containment. As of August 29, oil refineries and chemical processing facilities along the Gulf Coast of Texas from Tropical storm Harvey had released more than 2 million pounds of hazardous chemicals, some of which include sulfur dioxide, benzene, 1,3-butadiene, nitrogen oxides, various volatile organic compounds (VOCs) and gaseous hydrocarbons. These chemicals are highly hazardous, with many being known carcinogens. Other risks come from the area’s sprawling chemical and petroleum pipeline transmission systems, which are vulnerable to damage from surging waters and floating debris. One such incident occurred in the town of La Porte, Texas where a 14.5 mile pipeline used to transport anhydrous hydrogen chloride ruptured, releasing a yet undetermined amount of the chemical. Anhydrous hydrogen chloride is a non-flammable toxic gas used in the manufacture of synthetic rubber and pharmaceuticals, as well as gasoline refining and metals processing. It is highly corrosive to the skin and eyes, and can cause damage to the lungs and upper respiratory tract if inhaled. Safety data sheet (SDS) information for anhydrous hydrogen chloride indicates that fire-fighters should wear appropriate protective equipment and self-contained breathing apparatus (SCBA) with a full face-piece operated in positive pressure mode during exposure to the gas. Always refer to a manufacturer’s specific product safety data sheet for exact fire-fighting and other safe chemical handling and storage information. If you need to access a safety data sheet for a particular chemical, you can search our expansive MSDSonline library from the SDS /MSDS Search page at www.msdsonline.com/msds-search. The leak, first reported around 5:00 p.m. CDT on August 28, was significant enough to prompt local officials to issue a ‘shelter in place’ warning as far North as Baytown, and as far south as Shoreacres — an area with a radius of roughly 6 miles from the site of the leak — asking residents to close all doors and windows, and to turn off all forced air ventilation systems. Fortunately, the leak was contained by fire crews that same night, and no injuries have yet been reported as a result of the incident. Yet another source of risk comes from the fact that Harris County, which encompasses Houston and the surrounding communities, contains more than a dozen active TCEQ and federal EPA Superfund sites. These sites have been shown to be contaminated with extremely high levels of toxic chemicals, including pollutants like dioxins, lead, arsenic, perchloroethylene and chlorinated hydrocarbons that are highly hazardous to humans. Flood waters have the potential to suspend these substances and deposit them beyond the boundaries of the contaminated sites. As first responders and emergency personnel begin the long and arduous process of cleaning up after flood waters recede, they may come in contact these substances in unpredictable and imperceptible ways. With certain such chemicals of concern already identified, it is imperative for emergency crews to understand the physical and health hazards they pose and to account for those dangers when taking action. Such information can be found on chemical safety data sheets. In addition to the hazards that have already been identified, there are an untold number of unknown hazards that first responders may encounter as a result of the sheer volume of chemicals that are processed and stored at facilities in the affected areas. Companies that process and store these chemicals should have a clear and timely means of communicating chemical safety information to first responders so they can take the necessary precautions to protect themselves before heading into affected areas. Ideally, this information should be shared before an emergency occurs, but should also be made immediately available during an emergency. With the safety of emergency responders in mind, VelocityEHS created the MSDSonline Plan1 First Responder Share Service. Available through its MSDSonline HQ and HQ RegXR Accounts, Plan1 gives companies a more efficient way to provide first responders with quick and easy access to information about their chemical inventory, including a virtual floor plan of their facility displaying the locations of chemicals down to the container, along with each chemical’s corresponding SDS, right from their mobile device. As the flood waters begin to recede, first responders and recovery workers need to be conscious of chemical hazards present in the affected areas, and take the necessary steps to protect their own health and safety while working hard to help others. Though chemical hazards can be difficult to anticipate, VelocityEHS, through its MSDSonline chemical inventory management solutions offers instant mobile access to millions of SDSs to help prepare you for virtually any chemical hazard you may encounter. Visit our website at www.msdsonline.com, or give us a call at 1.888.362.2007 to learn how we can help you.